teamwork – Stones, and Tokens, and Hearts, Oh My! You may recall a while back Brenda shared the story of the marble energy stones and why we were discontinuing them in her post called It’s hard to say goodbye. We had been selling out of them pretty steadily but still had three words left: Love, Kindness, and Teamwork. We were mystified that Love and Kindness had not sold out earlier, as they tend to be among our most popular words and we knew a corporation or school would scoop up those Teamwork any day. This phrasing “It’s okay to go now” has really powerful meaning to me. Nine years ago, I lost my mother to pancreatic cancer and near the end of her battle, hospice care was called in. The hospice workers were like angels who knew exactly what my mother needed, but also what myself and my brothers needed in that terrible time. In Mom’s last few days, one of the hospice nurses advised me to tell my mom it was “okay to go now” so she could be at peace and not worry about us kids. It was absolutely the hardest thing I have ever done, but also one of the most freeing for both her and me. So you see when I told the marble stones it was “okay to go now” I truly meant that it was their time to go out into the world and touch someone’s life, if even for a moment. 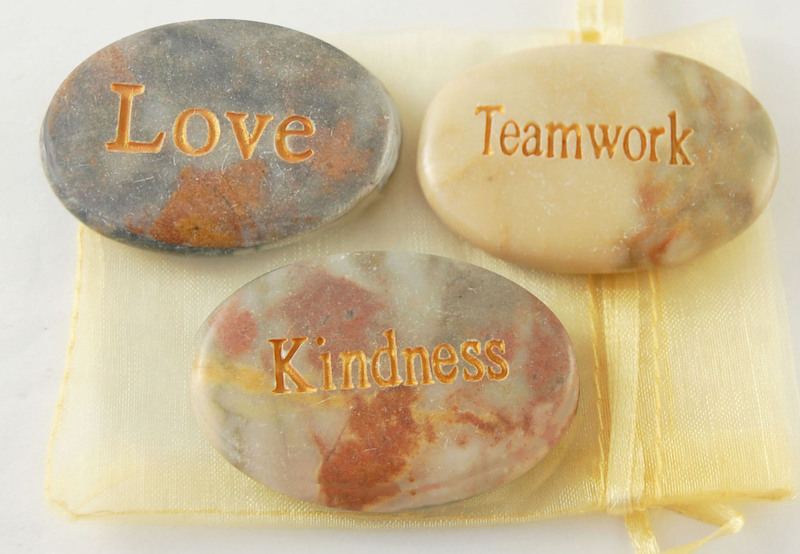 The next day we received an online order for 200 each of the Love and Kindness marble stones. I did a quick count and called the customer to let her know that we only had 175 left of those two words and she was happy to take them all and substitute glass stones to make up the difference. I finished the phone call and whooped with joy that we had sold out of two more marble words and were down to just one. Oh my Universe, I hear you loud and clear.